Cobalion in game: 1,020 Who? Important notice! Pokemon Cobalion is a fictional character of humans. 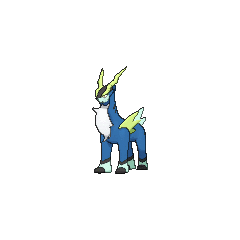 Cobalion (Japanese: ????? 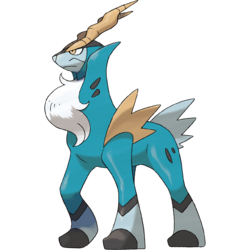 Cobalon) is a dual-type Steel/Fighting Legendary Pokémon introduced in Generation V.
Cobalion is a quadrupedal Pokémon that possesses traits of stags and goats. 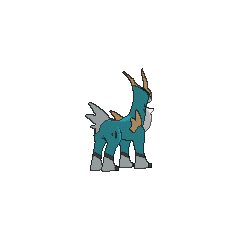 It is covered in aqua blue fur, and has jagged yellow horns similar in shape to thunderbolts. Its snout is a lighter shade of blue than the rest of its fur, and there a black blaze running from its nose to the back of its head. On its long neck and hind legs, there are small gray spots. It has a white tuft of fur under its neck, resembling a cravat. On its shoulder blades are yellow protrusions that resemble fins. Its tail resembles these protrusions, albeit in the same color as its snout. 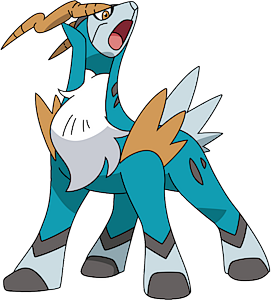 Cobalion's legs have black bands with lighter fur underneath and large black hooves. Cobalion made its debut in the fifteenth Pokémon movie, being one of its stars along with Terrakion, Virizion, Kyurem and Keldeo. Along with Terrakion, Virizion, Kyurem and Keldeo, Cobalion can speak through telepathy. In the Black & White chapter, Cobalion appears in the Mistralton Cave where his colleagues, Terrakion and Virizion, are being challenged by Trish of the Riches. Trish is startled into dropping her fire torches and causing a blaze inside the cave. The trio work together to put out the fire, then take Shoko and Trish's Pokémon away, only to give them back after persuasion from Black. Later, Cobalion leads his colleagues to Pledge Grove. On the way, Cobalion fends off an attack by the Shadow Triad on them. Upon arrival, the trio teach their new apprentice, Keldeo, how to use Sacred Sword. Cobalion then makes the decision to confront the Shadow Triad. Cobalion has the highest Defense base stat of all Fighting-type Pokémon. Cobalion and Cobalon are derived from cobalt (a metal and a color) and possibly stallion or champion.